It is to be feared that for some time past the name of Poplar has been known too widely as that of a place where rather daring experiments have been made by one of the local governing bodies, and that it has in consequence gained a by no means desirable publicity. As these were experiments purely ephemeral in character, and in addition assumed a political aspect, nothing more need be said about them here; we would rather make an effort to disabuse the minds of those many thousands of people who only know of the Borough through particular episodes by showing that Poplar, both in an ancient and modern sense, has other and much more pressing claims on their attention. In an ancient sense, Poplar has an interesting history; in more modern times it has become the centre of a most important group of industrial districts, and as such it still remains, as other pages of this Guide will show. There does not appear to be that difference of opinion as to how Poplar originally derived its name which attaches to the names of so many other London boroughs. Indeed, the supposition is that it came simply from the large number of poplar trees which in olden times, nurtured by the moist riverside soil, were to be seen here. Dr. Woodward, who seems to have been the first to call attention to this now generally accepted derivation of the name, declares that when he wrote in 1720, many of these poplars were still standing "as testimonials to the truth of that etymology." A TOUR OF THE PARISH. In the immediate vicinity of the present High Street at that time stood the East India Company's Almshouses and Chapel; the former were already in existence when the Chapel itself was erected, the latter dating from 1654, but reconstructed in 1776. These Alrnshouses and the Chapel have long since disappeared, and the grounds wherein they stood, together with the greater part of the old cemetery, are to-day a delightful Recreation Ground extending in a northerly direction to the East India Dock Road, tastefully laid out and maintained by the Borough Council. There are some fine foliaged trees in this public park, which in the summer offer grateful shade to those who seek the quiet of this sylvan retreat, and a plentiful supply of garden seats. "In memory of 18 children who were killed by a bomb dropped from a German Aeroplane upon the L.C.C. School, Upper North Street, on 13th June, 1917." Until 1817 Poplar had no separate parochial existence, being but a hamlet in the parish of Stepney. 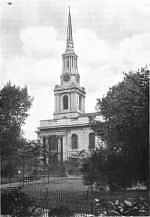 St. Matthias, Poplar's oldest church, originally known as Poplar Chapel, since added to and considerably altered, was erected in 1766 as the Chapel of the East India Company, which had a chapel in the vicinity over a century earlier, as mentioned above. In 1866, the edifice, dedicated to St. Matthias, became the church of an ecclesiastical parish. The church itself is beautifully situated and stands at the back of the High Street, from which one gains access to it on this side. It contains monuments to several distinguished men; among others one to Robert Ainsworth, the Latin lexicographer (died 1743), whereon is an epitaph composed by himself; and another to George Steevens, the Shakesperian critic and editor, who died at Hampstead (1800), and was buried here; his monument is by Flaxman. The ceiling of the church is decorated with the Arms of the Old East India Company, and it is alleged the columns came from the wreck of the Great Armada. The Danish Church has a quaint charm of its own: it is easily reached by turning down King Street out of High Street. Here the Lutheran form of service is observed, and on Sundays one may see the Danes taking part in its religious exercises. 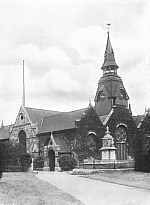 The late Queen Alexandra took a keen interest in this church of her country men, and presented it in 1875 with the service books, inscribing in them in her own hand, "For our Danish Church in London." Like those of the Dutch, the sacred building would not be complete without displaying its model of a vessel, and it is here to remind those of their race "who go down to the sea in ships" that they are not forgotten by such as remain in safety ashore. The distinction of being the Parish Church of the Borough belongs to All Saints', consecrated in 1823; this is a far more imposing edifice than the foregoing, and has a lofty steeple. It stands on the south side of East India Dock Road, and is built in the classical style after designs by Charles Holles. Nearly opposite this church is Poplar Town Hall, a substantial building with a somewhat ornate exterior and containing offices and halls of ample accommodation. The halls are in frequent request for public meetings and social events. All Saints' Institute, adjoining the Town Hall, is connected with the Parish Church, and is another well-equipped institution. With a fine billiard room, class rooms, library and facilities for games, the Institute is doing much to prove its utility ; it is fully licensed for entertainments, etc. EAST INDIA DOCK ROAD (and side roads leading from it). From Commercial Road (to be precise, the boundary is fixed from Birchfield Street), past the East India Docks to the River Lea, runs the splendid thoroughfare known as the East India Dock Road. Of good proportions, with wide pavements and spacious roadway, it is numbered among the finest main roads of the Metropolis, and contains an array of shops and other buildings that would do credit to any Greater London district. Facing the entrance to the Blackwall Tunnel in this thoroughfare is the Poplar Hospital for Accidents, an institution well worthy of the help of all charitably inclined persons. The building (originally the Custom House) has twice been extended to meet the requirements of the district. As evidence of the immense value of the Hospital in this locality it may be said that nearly eighteen hundred 'in-patients,' and forty-six thousand 'out-patients,' were treated in 1925. Massage, dental, and specialised cases have also been successfully dealt with. The Hospital has a Convalescent Home at Walton-on-the-Naze, where patients are sent to recuperate. Among other specially named beds in the Hospital, maintained by subscription or endowment, are the Metropolitan Borough of Poplar Air-Raid Cot, dedicated by sympathetic friends "in loving memory of the dear little children who lost their lives in the enemy air raid, 13th June, 1917"; The Will Crooks Bed, "to the memory of one who was ever a loyal, lifelong friend of the Hospital - the Rt. Hon. Will Crooks, who died in the Hospital 15th June, 1921"; The Nancy Lucy Cot, "in memory of the veteran journalist, Sir Kemp Lucy, with his good wishes for every sufferer lying in it," and another presented by the London and India Docks, " in grateful recognition of the splendid services rendered by the Hospital to the Staff of the London and India Dock Company, since the Hospital was established." Accidents in the Port of London, in the docks and shipping, amongst the factories and the engineering works, are of frequent occurrence, and often of the most terrible character. From this district it is over two miles to the nearest General Hospital. Immediate attention to the injured is often a vital consideration in case of accident ; hence the Hospital meets a great need in this district and has an especial claim on the benevolent ; it is estimated that 12 new cases are treated every hour of the day and night. George Green's School, in the main thoroughfare, has also a history behind it, and has produced many brilliant scholars. The School was erected through the munificence of George Green, a philanthropist who disbursed over £100,000 in charities; Chrisp Street and Bow Lane Schools owe their existence to his benevolence too; he also built and endowed the Sailors' Home in East India Dock Road, now the Board of Trade offices. The Poplar Pavilion is a cinema theatre near the docks; All Saints' Church is near, and the L.M.S. Railway Station is in the same road. Chrisp Street is a famous thoroughfare suggestive of Middlesex Street, the old Petticoat Lane. Here are displayed on stalls a heterogeneous collection of wares that would have aroused the envy of Autolycus: it is said you can buy almost anything in this market: it would be heresy to doubt it. King George's Hall, a Wesleyan War Memorial on the other side of the East India Dock Road, is a Men's Club, Institute, and Gymnasium. The upper floor is used as a Cinema Theatre. School of Engineering. Keenly alive to the requirements of the locality, the L.C.C. School of Engineering and Navigation in High Street, reached by way of Woodstock Road, boasts a full muster roll. Considering how many of the rising generation of this borough adopt the sea as a profession, this School offers unique advantages. Among the subjects taught are seamanship and navigation, nautical astronomy, marine engineering, naval architecture, propulsion, electrical and marine engineering, carpentry and joinery, and theoretical and practical chemistry, physics, etc. The roof of the building is flat and especially adapted for astronomical observation. The School was opened on behalf of the L.C.C. by the late Sir William Collins, and is one of the best equipped of its kind in England; the fees are singularly moderate, and every encouragement is offered to the youth who is ambitious to excel. The Presbyterian Church is in Plimsoll Street; the Public Baths and Wash-houses (among the first to be erected in London) are in the main road and prove of immense utility to thousands. The Poplar Wesleyan Church, in the East India Dock Road, has a big seating capacity and a large following; it does an immense amount of good work in an unostentatious way. The first Wesleyan Society was formed in Hale Street about the year 1800. The snares laid for sailor men in the old days are now opposed by many philanthropic and benevolent institutions, and the mariner, home from his voyage, is well looked after, and can always rely on finding a welcome at one or other of the Institutions devoted to his welfare when on shore. Such an one is the Mission to Seamen Institute, in East India Dock Road; it is a fine red brick building of imposing character, and does a splendid work among those for whom it was erected. The Board of Trade Mercantile Marine Offices (formerly Green's Sailors' Home) are one of the busiest centres in London. In Jeremiah Street another Seamen's Rest, under Wesleyan auspices, opens its welcome doors in hospitality to the seafarer; the building is dedicated to the late Queen Victoria and meets a distinct want. 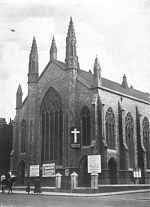 Trinity Congregational Church (commonly known as Green's Chapel) is also in East India Dock Road, with a well-built Church Hall for meetings, etc., attached, this building being another of those owing its existence to the generosity of George Green. St. Stephen's Church (CE. ), near by, is an imposing edifice with a fine interior. Among the places of amusement in this thoroughfare are the Gaiety and the Poplar Hippodrome, the latter offering variety entertainment of an attractive type. In Follet Street is the beautiful Church of St. Frideswide, the foundation stone of which was laid by the Duchess of Albany, July 6, 1889. Stainsby Road and Birchfield Street opposite indicate the boundary of Poplar Borough in the East India Dock Road ; the corner building is occupied by the Westminster Bank, Ltd., Limehouse Branch. In Canton Street is St. Mary and St. Joseph's (R.C.) Church, a fine cruciform building seating 800 people. THE HIGH STREET. Although second in importance to the East India Dock Road, the High Street, formerly known as Poplar Street, can boast preeminence in antiquity and history ; though it is a pity that its fine buildings, such as the Borough Council Offices, for example, should be so hemmed in by houses that they do not appear to architectural advantage. In High Street throbs the official life of Poplar: here are the principal offices of the Municipality, and at 136 is the Finance Department, almost adjoining the Public Library. Accommodated in the High Street Library is a valuable collection of house flags used by the various lines of famous old ships which sailed from the adjoining Docks. Here is the blue cross on a white ground of the T. W. Smith (Madras) vessels; Joseph Somes' fleet, as one may here see, flew the St. George's with crown and gold anchor; Messrs. Blythe & Co. hoisted at the main a large black circle in place of bunting; the flags of the China tea fleet are here, together with those who traded in wool and other merchandise: the collection is unique and highly interesting, many of the examples being the actual flags used on the voyages. In the High Street, too, is the Coroner's Court, and close at hand Poplar Institution. Here also is the Queen's Theatre, devoted to revue, drama and moving pictures, a house of frequent resort by visitors from the other ends of London. BLACKWALL. Blackwall Pier - the name conjures up suggestions of ozone and sea breezes. The Pier, originally called Brunswick Pier, runs in front of Blackwall Station, and here in fine weather come many a resident and visitor to enjoy the wonderful view obtained from this vantage ground. On the Terrace, given a clear day, the verdant woods of Shooters Hill and the towers of the Crystal Palace may be clearly descried, with Greenwich in the foreground; the river here is usually a busy scene and offers unwonted interest to the observer; there is a liberal supply of seats and the Pier is an undoubted attraction. Blackwall Tunnel. This fine example of engineering skill, owing probably to the fact that the Tunnel is some miles from the centre of the city, does not receive the notice it really deserves. The Tunnel was begun in 1892 and opened for traffic in 1897. Great difficulties were encountered in constructing it, but thanks to the indomitable perseverance of those concerned, all these were at length successfully surmounted. The Tunnel is 6,200 feet long, and has an internal diameter of 24 feet, 3 inches. One-fifth of the whole is under the river. The roadway is sixteen feet wide, sufficient for two vehicles to pass each other, and the footpath three feet wide in the Tunnel, and five feet three inches wide in the approaches. There are four entrance or exit shafts, two on each side of the river. The main entrance for vehicular and pedestrian traffic on the Poplar side is at the end of the East India Dock Road, with entrances for foot passengers only in Blackwall Cross and Prestons Road. The engineer was Mr. (afterwards Sir) Alexander Richardson Binnie. The imposing entrances of polished granite with shields bearing the arms, carved in relief, of the counties linked by the Tunnel were designed by Mr. Thos. Blashill, F.R.I.B.A. The Tunnel was formally opened by the late King Edward VII, whose name is associated with other public undertakings in the Borough. It is said that the house once occupied by Sir Walter Raleigh was amongst those swept away in carrying out the work. The Tunnel Gardens are the happy hunting ground of the little ones, who erect their castles in the sandpit and enjoy the advantages of the open air. These Gardens, which owe their existence to the late Mr. Will Crooks, are also appreciated by 'the grown ups,' who find pleasure and interest in the pretty surroundings. "At Blackwall. Here is observable what Johnson tells us, that in digging the late Docke, they did, 12 feet under the ground, find perfect trees over-covered with earth. Nut trees, with the very branches and nuts upon them; some of whose nuts he showed us, their shells black with age, and their kernell upon opening, decayed but their shell perfectly hard as ever." "The extent and character of these relics justify the opinion that they were found where they grew, and that they were submerged either by the elevation of the bed of the river, or by the subsidence of the entire district in which they were found. The subterranean forest which is thus from time to time disturbed is, it would appear, of considerable extent; it is traced from the riverside opposite the dockyard at Deptford, across the East India Docks, and reappears in Essex." Blackwall is on the north-eastern side of the peninsula, in which much of the Borough is situated. Strype, the eighteenth-century historian, suggested it got its name from the dingy vegetation with which in early days it was over-run; another writer upon the subject has fancifully suggested that when the East wind howled over the place, which at that time was very exposed, it made it very cold, and that the name really derives from 'bleak.' It was from Blackwall in 1577 that the gallant explorers, Martin Frobisher and Hudson, started on their expeditions to the arctic in search of a north-west passage to India. Quite near the domed No. 1 Entrance Shaft to the Blackwall Tunnel, and facing the Docks, is the fine red brick building of St. Nicholas Church, with a handsome interior. It contains, among other interesting objects, a beautifully illuminated 'Roll of Honour' to those who fell in the Great War. Passing over the bridge, strangely reminiscent of a scene in Rotterdam, Blackwall Basin is seen. Dockyards, wharves, timber yards and manufactories are on either hand as we proceed. The Church of St. John, in Manchester Road, occupies a commanding position, and has an exceptionally beautiful interior. In the same road is the Primitive Methodist Chapel. CUBITT TOWN, to the south of Blackwall, is the next place of interest in our tour of the Borough. This settlement evokes our admiration, for the houses are neat, the roads wide, and there is a distinct absence of squalor or overcrowding. The 'Town' takes its name from the celebrated building firm of Cubitt & Co., who established here a manufactory of ceramic ware some years ago. Buses run from Cubitt Town to Mile End and there link it up with the busy City. The Cubitt Town Free Library, opened in January, 1905, in Strattondale Street, is on the 'Open Access' system, by which means borrowers can select their own volumes from the shelves with full satisfaction to themselves and a saving of time to all concerned: the library is open from 9 a.m. to 9.30 p.m.
Christ Church, with its slender steeple, is near, a capacious building and an excellent specimen of architecture. At the entrance is an impressive crucifix memorial to the local heroes of the Great War: an exquisitely executed work worthy of close inspection. Parallel to Manchester Road is Wharf Road, and here are the Island Gardens, covering about two and a half acres, with a terrace seven hundred feet in length, along the river front. The view of the Thames at this point is distinctly interesting. Immediately across the stream is Greenwich, with its Naval College, Park and Observatory. This picturesque open space cost over nine thousand pounds, and Poplar Council, recognising its value to the community, paid one-third of this sum to the London County Council, which body remains the custodian of the park - a guarantee that it is not neglected. The Island Gardens boast a fine Bowling Green and a Bandstand; in summer time this park is visited by thousands of appreciative residents. Back in the main road we note the railway bridge spanning the thoroughfare, and in the Manchester Road the new Council Houses, seventy-two in number, now, at the time of publication, being erected, attract attention: many of them, in fact, are actually complete and occupied; they are charmingly designed, have pleasing interiors, and represent the last word in municipal house-planning. Beyond these houses wharves innumerable extend along the riverside. In British Street is the Isle of Dogs School (1847), now utilised for a Cookery Centre, and also another L.C.C. School for boys, girls and infants. Near by, in the main (West Ferry) road, is St. Cuthbert's Church, with St. Edmund's (R.C.) School Hall (1923) close at hand. St. Edmund's (R.C.) Church is an imposing edifice; a statue of the patron saint is seen over the portico. At Millwall are the Open-Air Baths, which are referred to elsewhere in this work. In West Ferry Road is the factory of Maconochie Bros., who during the Great War provided millions of tins of 'rations' for the troops. Invented by Mr. Archibald White Maconochie, who died early in February, 1926, the rations' consisted of beef, vegetables and gravy ready for consumption, a diet of the greatest value for the Forces at a time when the difficulties of rationing had become almost insuperable. Mr. Maconochie was Liberal Unionist M.P. for East Aberdeenshire in 1900-1906, and also a member of the Tariff Commission. The firm began business at Lowestoft in 1873: to-day the name is a household word. 'Beachcomber,' in the Daily Express, said: "The name Maconochie is a kind of 'spell-word' to evoke the slimy parados you leaned against, the sagging sandbags, cold knees and wrists, and drizzling dawns." Perhaps of even greater interest is the fact that on this site was the shipyard of Scott Russell, where the 'Great Eastern' steamship was built and launched in 1857. With a length of 680 feet it was then the wonder of the world. It had both paddle-wheels and a propeller, with engines of 1,000 horse-power. This ship cost to build nearly £l,000,000, but it was always meeting with unfortunate accidents. It will ever be remembered for the work of laying the Atlantic cable. It cannot be argued that the spiritual side of life is lost sight of on the Isle of Dogs. St. Paul's Presbyterian Church, Millwall, is yet another building for religious worship. The Sailors' Rest and Institute stands on an island site by Millwall Docks. It was opened by Lady Brassey, and "all seafarers are welcome" here. It is under the auspices of the British and Foreign Sailors' Society and is doing valuable work. The three-storey building further north is St. Luke's School. Continuing onward to the bend of the road, we come to Garford Street. St. Peter's (C.E.) Church, Garford Street, has a good interior and ornate reredos, also a beautiful Chapel of the Blessed Sacrament at the east end of the aisle. Near to this church is the London Salvage Corps Station, and crossing to King Street we may reach the Ideal Picture Palace and the Danish Church, to which reference has already been made. The Ministry of London Port Workers Office is here, and Dingle Lane L.C.C. Elementary School is close at hand. For those of antiquarian tastes the most interesting part of Poplar parish, of which indeed it forms the largest portion, is the Isle of Dogs. How this part of Poplar came by its curious name still remains very much of a mystery. Various suggestions have been made. One of them, probably the most popularly credited in modern times, is that it arose from the number of dead dogs that used to be thrown up on the island by the tide. But no reason has been advanced why dogs should have found a last resting place here in outstanding numbers as compared with other animals. Reference to another derivation, suspiciously suppositious, is made by Strype, the historian, who was born in the neighbouring borough of Stepney in 1643, and hence was closely in touch with the life of the place. He says a certain man was murdered on the island by some person or persons unknown. A mystery it might have remained to the end of time but for the dead man's dog. This faithful creature refused to leave the body except at such time as it was forced to swim across the river for food. On one such occasion, encountering a certain Greenwich waterman, the dog was noticed to take a violent dislike to him, snarling at him whenever it saw him. This singular behaviour raising suspicion, the man was arrested and brought to trial, whereupon he admitted his guilt, and was duly and legally executed. A third theory as to the origin of the name has yet to be mentioned. It is to the effect that when one of our Kings - Henry VIII and Charles II both receive equal credit - was in residence at Greenwich, and used to hunt in Essex he kennelled his hounds here, in order to save the necessity of ferrying them over when going a-hunting. Hence the name 'The Isle of Dogs.' Yet other theories have been advanced, including the suggestion that the name is a corruption of the 'Isle of Ducks,' which perhaps is as reasonable as any. Originally this part of Poplar was not an island at all, but a long peninsula formed by the bend of the river, but it has been an island probably since the sixteenth century, if not for a longer time. Writing over 20 years ago the author of 'All in a Garden Fair' penned these lines: "We may conclude the Isle of Dogs contains an adventurous and prosperous population; the air they breathe when the fresh breeze that comes up with the tide has dropped is, perhaps, too heavily charged with the various fragrances (sic) of the multitudinous works, with the noises of various industries." Yet, he goes on to add, " It is a place where one might deliberately choose to be born because, apart from the general well-being of the people and the healthfulness of the air, there is a spirit of enterprise imbibed by every boy who grows up in this admirable island." At some remote period, probably before the birth of the seventeenth century, there was a ferry between the southern point of the Isle of Dogs and Greenwich and a road from the ferry running north through the island. That entertaining gossip of a bygone generation, Samuel Pepys, once adventured by this ferry, in order to attend a wedding. It was the year of the Great Plague of which Pepys, as Secretary of the Navy and a Londoner to boot, had already some experience, and he chronicles the fact that he saw "two or three houses marked with a red cross upon the doors, and 'Lord have mercy upon us,' writ there," so that the Isle of Dogs at that period was clearly not a place one would seek as a health resort. In company with Sir George and Lady Carteret he crossed in a boat from Deptford to meet a coach but, to his and their dismay, the coach failed to appear. To quote the diarist, "I being in my new colored silk suit and coat trimmed with gold buttons and gold broad lace round my hands, very rich and fine .... so we were fain to stay there in the unlucky Isle of Dogs, in a chill place, the night cold, the wind fresh, to our great discontent." In the middle of the Island, completely isolated, stood in those days a small chapel, but of its origin nothing is known. As late as 1795 the Chapel House was probably the only building on the Marsh (Isle of Dogs), then known also as Stepney Marsh, Wet Marsh, and Isle of Ducks. The Isle, at that time, belonged to the Manor of Pountfret. A dramatist, named Nash, wrote a play in 1598 called The Isle of Dogs, and was imprisoned for it in the Fleet. The vehicular Ferry was discontinued about 1890, and the passenger ferry rights were bought by the London County Council on the construction of the foot subway. "Under the auspices of our most gracious Sovereign, George III, and of the Imperial Parliament, the sanction of His Majesty's Government, and the patronage of the East India Dock Company, these Wet Docks, appropriated to the commerce of India, and ships in that employ, were accomplished in those eventful years MDCCCIV,. MDCCCV, and MDCCCVI." "This great undertaking originated in the laudable endeavour of the managing owners of ships in the Company's Service; and the important national objects of increased security to property and revenue, combined with improved accommodation, economy and despatch, were thus early realised through the liberal subscriptions of the Proprietor and the unremitting attention of the Directors of the East India Company." To a Mr. Perry belongs the honour of constructing the first Dock on the north side of the Thames; this was opened in 1790 and known as the Brunswick Dock; it was especially built for the reception of East Indiamen, and was on the site of the present East India (Export) Dock. Its success was immediate, proving the practicability of enclosed docks for ships and cargoes. The Thames pirates of those days were notorious; regular organised bands existed, under various names, as the Heavy Horsemen, the Night Plunderers, etc., and their robberies were rampant. It is said that of 37,000 persons employed on the river Thames at least 11,000 were thieves, and their annual booty amounted to half a million sterling. Mr. Perry's idea, therefore, was hailed with enthusiasm, and the West India Merchants subscribed £800,OOO for a Dock on the Isle of Dogs in two days. But they counted without their host in dealing with the 'circumlocution department' of the Government, and it was nine years later ere anything tangible was accomplished. In 1799 the Act authorising the construction of the West India Docks passed a cynical House of Commons. It is recorded that James I, most parsimonious of the Stuarts, had threatened the people with new taxes and imposts, and declared he would remove the court from London. "May it please your Majesty," answered the Mayor, "there is one consolation for the merchants of London: you cannot take the Thames along with you." Tradition is silent as to what the King said in reply. Taxation weighed heavily on the merchants under the Stuarts; to Tonnage and Poundage, James I added Impositions, a tax that aroused the Commons to protest. Tonnage weighed grievously on the Thames wine merchants, the tax being 1/6 to 3/- per tun, varying in the quality of the vintage; poundage was 7d. to 1/- on goods sold by weight. But notwithstanding these irksome taxes the East India wine merchants amassed great wealth, and their successors in the century following eagerly came forward to bear the cost of the proposed Docks. The South Dock,used principally for the mahogany and fine timber trade, opened its gates in 1870; it is formed out of a Canal which the Corporation of London were allowed to construct and to ask toll on all ships using the same. Miliwall Dock is at the southern end of the Isle of Dogs; it was opened in 1864; it cost about £7,000 per acre. Millwall is said to take its name from the seven windmills that stood on the river wall, a wall built to prevent the inundations to which the Isle of Dogs was frequently subject. A view of London, taken from One Tree Hill, Greenwich Park, in 1752, shows, as confirmation of this, seven mills standing along the river bank at Millwall, and a copy of this print can be seen in the Poplar Library. "As with Blackwall, so with Millwall," says a writer, " the opening of the Millwall Docks in 1864 brought to an end all its rural appearance, and the mills are now only a memory preserved in a name." There are two recorded cases where the wall, built to protect the Island from inundations, failed to stem the fury of the tide. In 1449, due to neglect of some landowners to repair the embankment, the tide broke through and a "thousand acres were drowned." The identical spot is alleged to have been where Limehouse Basin now exists; the second flood occurred about 1660, and Mr. Samuel Pepys records that "he saw the great breach which the late high water made." In 1806 Perry's Dock was incorporated with the East India Dock, and now covers an area of 30 acres. The water is thirty-three feet deep in the dock, and thirty-one feet on the sill at Spring tides; but it is never less than twenty-three feet. Perry's Dockyard, afterwards Green's, at Blackwall, became famous for the building of East Indiamen and clipper ships. "The House Flag of Green's," says the Council Calendar, "had an interesting origin. One of the Captains hoisted the red cross of St. George on a white ground. A naval captain ordered him to strike it, as this flag was not for merchantmen. The captain obeyed, but pulling a blue silk handkerchief out of his pocket sewed it across the in tersection of the cross and triumphantly hoisted it again." Zeppelins and other enemy aircraft were constant visitors over the Docks during the Great War, but fortunately did little damage. The name of Bromley is said to be derived from Broom (brushwood) and ley (a meadow). There is no doubt that brushwood grew in profusion on the old common which extended to Rhodeswell in Limehouse, and during the seventeenth century was the hiding place of many criminals anxious to evade the long arm of the law. Bromley-St.-Leonard, or Bromley-by-Bow (to avoid confusion with Bromley, Kent) lies to the north of Poplar between that parish and Bow. Its antiquity is not to be doubted: although the records are not quite clear, it is alleged to have existed in the Saxon period, and was extended by Bishop William, under William the Conqueror. There is also an interesting memorial to Sir Richard Munden, Knt., who was "engaged in 14 seafights," and is credited with the capture of St. Helena; he died 1680. Here also is a memorial to 'John de Bohun, Earl of Hereford, Constable of England, 1336,' and also one to 'Sir Wm. Benson, Knt., Lord of the Manor.' The Churchyard contains many interesting memorials, including a number commemorating Huguenots, who fled from France during the persecution. Visible evidence of the antiquity of this parish is afforded by the seventeenth-century buildings in the High Street. The Children's House. Here one sees philanthropy at its best, a centre for little ones. 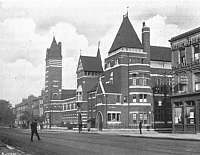 Designed by C. Cowles-Vosey, Esq., A.R.I.B.A., and built on the most approved lines, it is a building of which the neighbourhood has every reason to be proud, for here the children of the friendless and poor are received with open arms and 'mothered' by the kindly voluntary workers. St. Andrew's Hospital, situated in Devon's Road, is controlled by the Guardians. It is admirably administered, and thousands of sick and poor are treated at it with every consideration. The Poplar and Bromley Baptist Tabernacle in this neighbourhood is a brick building of fine proportions, with the entrance flanked by two towers. Near at hand is the Bromley Public Library, a handsome stone edifice conducted on the 'Open Access' system. The Library building contains a small but interesting Museum of local objects and many quaint documents, amongst these the ' Hamlet of Poplar Rate Book for 1806,' recording the fact that one of the ratepayers had taken a trip, at His Majesty's expense, to the Australian penal settlement of Botany Bay. Among the curios is a sermon preached in 'the Chapple of Popler,' dated 1693. From another exhibit the 'Churchwardens' Account Book, 1650-1690, we learn that "Dr. Buxton, one of the King's Chaplins, was paid £5 for his sermon on the Thanksgiving Day for the happy restoration of King Charles II." Another entry, under the year 1671, states that " Mr. J. Hodder, Churchwarden, paid Monday, the carpenter, for making ye stocks and whipping post, £2 17s. 9d. "; also, "Paid to a poor woman to redeem her husband from slavery, one shilling"! "Whereas the Stocks in your said Parish are become useless by reason of their decay these are therefore in His Majesty's name to will and require all and each of you on sight hereof, to cause the stocks to be rebuilt, and substantially set up in the crossway at the end of the I.ane (Black Alley), going into the fields near the Bowling Green in your said Parish, 28th November, Anno Domini, 1772." The Ducking Stool, another relic of a barbarous past, stood in a field on the south side of Devon's Road, now covered by houses, but then called Ducking Pond Field. 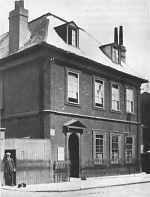 The British Red Cross Society has a branch in Brunswick Road, with an out-patients' clinic attached; excellent work is done here, and sick room necessaries are loaned, a great boon in a poor district. The Lower Manor House, also in Brunswick Road, is a building of considerable age; it was occupied for some time by an actor named Woodin, who was an industrious collector of oak carvings. The structure still bears many traces of the Renaissance. At a later date the ceiling and part of the staircase were decorated by Telbin, who was a scene painter at Drury Lane Theatre. The Manor House, together with the old Bromley Hall next door and two other houses, is now occupied by the Royal College of St. Katharine, which maintains an Infant Welfare Centre in co-operation with the Public Health Department of the Borough Council. The College has a long and interesting history, having originated as a religious foundation on the site of the present St. Katharine's Docks in 1148. Her Majesty Queen Mary is Patron, and the Bishop of London is President of the Chapter. In glorious memory of men from this parish who gave their lives in the Great War; their name liveth for ever. 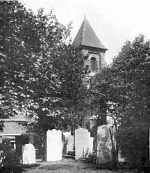 Immediately behind the Memorial is the Church of St. Michael and All Angels, with conspicuous clock steeple: the site for this building was given by Mr. David MacIntosh, and a tablet records that Countess Elmara assisted at the inauguration, 29th September, 1864. At the junction of Morris Road is the Church of St. Gabriel, erected in 1869, with one of the few surviving church schools adjoining. 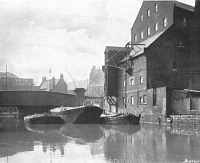 In Violet Road are the huge depots of Pratts Motor Spirit Co. and the Anglo-American Oil Co. Ltd. Across the bridge that spans the Limehouse Cut here a mural tablet states that " the bridge was opened for ever," 19th May, 1890, by Walter Hunter, Esq. In this thoroughfare, too, are the extensive Borough Council Electric Light Works. The Council is desirous of promoting the use of Electricity for all purposes, and offer substantial inducements both with regard to light and power. Opposite the Works is the Disinfectant-producing Dept of the Public Health Department. The Open-Air Swimming Bath, in Violet Road, is a keenly appreciated amenity of the borough. Mixed bathing is permitted. The bath is beautifully tiled, kept scrupulously clean, and provided with the necessary dressing rooms and appointments: there is also a suite of slipper baths in the same thoroughfare. The L.M.S. Railway has a Goods Depot also in Violet Road. He lived at Bromley in his day." The whole of the state room on the ground floor, with its beautiful oak panelling and moulded ceiling, was moved to and set up in the South Kensington Museum, thus preserving a valuable relic of the past. A large 'achievement,' measuring 8ft. by 7ft., carved in high relief and bearing the arms of Charles I, was not so fortunate; in point of fact, no one seemed to want it; at first it found a home in the old Parish Church, but it was moved thence in 1818; subsequently it passed into the possession of the National School, where it remained some time. Its present resting place is the Good Shepherd Mission Hall, where it may now be inspected, but its many vicissitudes have not improved its appearance. Tudor House stood on the site of the present Recreation Ground between Grace Street and the Congregational Chapel. In its day it provided accommodation for Scottish favourites of the Court, and James I was traditionally a visitor there. The Seven Stars Inn, in the High Street, dates from the seventeenth century, and was formerly a Freemasons' lodge; but modern improvements have destroyed its old-world character. Bromley Recreation Ground. This valued open space of nearly two acres lies to the south of the Parish Church, and was originally the garden attached to the Tudor House referred to above; it was opened to the public in 1900. The London County Council have spared no pains to make the ground attractive, and not the least appreciated feature of it is the children's gymnasium, much patronised by the little ones who flock here in crowds during line weather: swings, horizontal bars, and parallel bars are amongst the equipment provided. At the end of the Recreation Ground is a massive gateway which originally formed part of Northumberland House, Whitehall. A couple of ship's figureheads are among the features of the garden. The War Memorial in the ground consists of a goodly-proportioned granite column, erected by the residents of the North-East Ward and bearing the names of officers and men of the locality who gave their lives in the Great War. Bruce Road Congregational Church stands at the corner of St. Leonard's Street; it is a spacious building, and attached to it is a capital Mission Hall. 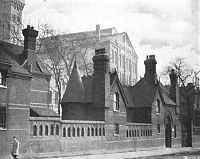 (1) Sir John Jolle's Almshouses, of Bruce Grove, Tottenham, four houses allotted to Bromley, the recipients also receiving from Fuller's charity /92 is. 8d. each per annum. (2) Sir John Jolle's Charity for Poor People; a bequest yielding an income of £1 per annum. (3) Thomas Ferrar's, Christopher Morgan's and William Snelling's Charity, dispensed in bread, coal and flannel. This charity has an annual income of £12. (4) R. Newman's Charity, also dispensed in bread, coal and flannel; it has an annual income of £4 3s. Bow is said to be named from the bridge that spanned the River Lea in this neighbourhood, and which was built under the direction of Matilda, wife of Henry I, who had been, to use her own facetious reference to a former unhappy experience of hers in crossing the ford, 'well washed' in the water of this river. Leyland says that "she caused two bridges to be built in a place one mile distant from the old ford, of which one was situated over the Lea, at the head of the town of Stratford, nowe called Bowe, because the bridge was arched like unto a bowe, a rare piece of work, for before that time the like had never been seen in England." It was over the old Bow Bridge that the great procession of 'Our Lady' annually wended its way to Westminster Abbey up till the time of the Reformation. By way of this bridge too, in 1381, came that redoubtable rebel, Jack Straw, leading the malcontent peasants of Essex, with Watt Tyler at the head of the Kentish contingent. The original Bridge at Bow existed unchanged for centuries, but was subsequently converted into one of three arches. In 1835 it was replaced by a wider structure, but increasing traffic eventually proved too much for this one also, and in 1903 the bridge had to undergo further widening improvements. For French of Paris was to hir unknowe." According to an eminent authority the allusion here is to the French taught by the nuns of the neighbouring convent of St. Leonard, Bromley, in which it would seem the Parisian accent was conspicuously lacking. BOW ROAD. Bow Road forms the eastern arterial thoroughfare of East London and extends from its junction in Mile End Road to Bow Bridge; it contains several interesting buildings and places of worship, particulars of the more important of which follow. Bow Wesleyan Chapel is an imposing structure and draws large congregations. A sound educational curriculum distinguishes the Stepney and Bow Foundation Schools for Girls and Junior Boys in this thoroughfare; the building, known as the Coborn School, is on modern lines and handsomely equipped. The Salvation Army School building in this was originally occupied by the late Dr. Barnardo ere his scheme assumed its present proportions. The Salvation Army School accepts homeless, destitute, and 'down-and-out' lads; provides them with a home and healthy discipline, and endeavours to convert them into good citizens. The home accommodates 40 boys, and no genuine case is ever refused. Funds are urgently needed to continue this good work of rescuing Young England from the gutter and a possible life of crime. Bow Road contains three railway stations, those of (1) The L.M.S. (London, Tilbury and Southend section) and District Railway (Mansion House and N.); (2) The L.N.E.R. (Great Eastern section) ; and (3) The L.M.S. (N.L. section), Poplar and City. Near the District Station is the East London L.C.C. Day Continuation School. Here training is given in various trades, and students are educated to take a useful part in the industrial life of the community. Tredegar House, also in this thoroughfare, is an imposing edifice utilised as a Training School for Nurses in connection with the London Hospital. Amusements are not lacking in Bow Road. Here is the Bow Electric Theatre, devoted to cinema entertainments; and the Embassy Billiard Hall, with 22 tables. Outside Bow Station is the Bryant & May Testimonial Fountain, an ornate structure with an emblematic female figure seated beneath a canopy, the whole standing some thirty feet high. It was erected in 1872 by employees of the firm to commemorate the defeat of a proposed tax of a halfpenny per box on matches, included in the Budget of 1871 introduced by Robert Lowe, afterwards Lord Sherbrook. At Nos. 149 and 151 are the Conservative and Unionist Club and Associations. The Public Hall building is shared by Bow and Bromley, and is in frequent request; there are spacious rooms for social functions, while on the ground floor are the offices of the rate collectors. The office of the Sub-Registrar of Births and Deaths is also in this building. The Inland Revenue has offices in this thoroughfare, occupied by the Inspector of Taxes. Bow Baptist Chapel is in the vicinity; it stands near Bow Bridge, and has a convenient Church Hall adjoining. The ancient grey-towered Church of St. Mary Stratford Bow, built in the Decorated style, occupies an island site in the middle of Bow Road. A statue of W. E. Gladstone stands in front of the church. The statue was presented to the Borough by Messrs. Bryant & May, the well-known firm of match-makers, whose works are at Bow. Nearly opposite Bow Church is the Roman Catholic Church of Our Lady and St. Catherine: it contains a stained-glass window which should be seen, and other interesting features. And roll in couples adown One Tree Hill." The office of the Public Health Department is situated at the corner of Fairfield Road, and from here the health of every part of the Borough is closely guarded under the watchful care of the Medical Officer of Health. Close by is the Guardians' Relief Office, in recent years a busy centre owing to the prevalence of unemployment. The imposing works of Messrs. Bryant & May, the match manufacturers, whose name has been a household word for generations, and whose productions have found their way long since to all parts of the world, are situated in Fairfield Road. Here employment is found for thousands of workers of both sexes, who make the matches under the most hygienic conditions. It is a pleasure to be able to add that these busy workers are treated with consideration and sympathy, and that the firm has always shown an excellent example in promoting cordial relationship between masters and employees. Messrs. Bryant & May have also been conspicuous on many occasions in supporting good causes making for the social betterment of the Borough. St. Stephen's Church, situate in Tredegar Road, North Bow, is an imposing building with two towers. In front of the church is a beautiful shrine, containing a miniature crucifix, forming the War Memorial, and bearing the inscription, 'For God, King and Country.' The church in the summer is surrounded by luxuriant foliage, which greatly contributes to its beauty. Near it are the headquarters of the 17th London Territorial Regiment (formerly the London Regt.) of Poplar and Stepney Rifles. The L.C.C. Educational Centre and Divisional Offices which control the Schools of the district are situated at the corner of Stafford Road. In this road are the Bow Baths and Wash-houses belonging to the Borough of Poplar. Here, too, is the Bow Public (Passmore Edwards) Library, the popularity of which has outrun its accommodation; the building is made conspicuous by a public clock erected as a memorial to the late E. W. MacCullum. The Roman Road L.C.C. School, in this thoroughfare, is notable as being a centre for training in woodwork, amongst many other subjects of a useful and practical character. The North Bow Congregational Mission Church, also in this road, is worthy of remark as having a woman minister, the Rev. Mary G. Collins. The L.C.C. Fire Station, in Parnell Road, running out of Roman Road, is a conspicuous building with residential quarters for the men and their families. It is splendidly equipped with all the latest appliances for fire brigade work, and is always maintained ready on the instant for any emergency. The Station was formally opened in May, 1911, by the Chairman of the London County Council Fire Brigade Committee. Great efforts have been made by the Poplar Borough Council to reduce tuberculosis in the Borough, and a special department at 1, Wellington Road is devoted to the purpose. It is gratifying to be able to record that there has been a marked decrease in the disease in the borough since this Department was established. OLD FORD. Situated to the north of Bow Road, Old Ford derives its name, it would seem, from the old ford over the River Lea: it has yielded from time to time many relics of the Roman occupation, including a number of Roman coffins. To-day it is a populous, busy and well-conducted area within the Borough boundary. It has not always enjoyed the good reputation it now bears, for between Bow and Old Ford once existed a thoroughfare known as 'Cut Throat Lane,' a descriptive appellation which, we may believe, did not belie the character of this by-way. Old Ford Road extends from Bow Road to the Regent Canal; it does not contain many buildings of a striking character. Compton's clothing factory is here, and Waterlow & Sons' Works. The Salvation Army Mission premises are at the corner of Armagh Road, and the Old Ford Wesleyan Church, a building of some architectural pretensions dating from 1880, is in the main road. A branch of the Borough Baths and Washhouses, recently opened, is in Wick Lane; it is admirably fitted up and offers conveniences undreamt of half a century ago. St. Paul's Church, Old Ford, is another outstanding edifice and has a large congregation. Old Ford Station, connecting with Broad Street and City, is in Old Ford Road. The ground now occupied by the L.M.S. Railway, Bow Goods Depot, was formerly the East London Waterworks. VICTORIA PARK. The boundary of Bow includes part of this beautiful park. In a district where open spaces are few, this green oasis among the surrounding buildings is a great boon. The Park covers 217 acres and is under the control of the L.C.C. It contains three lakes with facilities for mixed bathing, a well-equipped gymnasium, sandpits where the little ones may dig to their hearts' content, aviaries, and a wonderful chrysanthemum house; in short, there are manifold attractions in this delightful sylvan retreat. The Terrace Entrance to the Park is in Old Ford Road, just over the Regent's Canal bridge. In connection with Sir John Jolle's Charity four of the Almshouses at Bruce Grove, Tottenham, are allotted to Bow. They are administered by the Drapers' Company, who pay £25 4s. a year for each case, and include medical attention and nursing free, a sum of 2/6 on the annual visit, and a ton of coal yearly; when vacancies occur the Bow Ward nominates the candidates for the approval of the committee of the Drapers' Company, which body makes the election. The Prisca Coborn Charity (Miss Coborn was a resident of Bow when it was a village) consists of money gifts to the poor of Bow who have large families. The Charity has an annual income of £16 13s. 4d. Under the Stepney and Bow Foundation [set up by the Charities Commission to run Coborn School for Girls and the Coopers' School for Boys], a Governor of the Foundation is nominated by the Councillors of the Bow Ward and appointed by the Council. The Lea, which forms the eastern boundary of Poplar, Bromley and Bow, but faintly resembles to-day the stream in which the consort of Henry I received her involuntary wetting before she earned the blessing of travellers in these parts by causing the first bridges to be built across it. In its course of twenty-seven miles to its junction with the Thames it sadly deteriorates, and although the upper reaches still possess many pretty spots, the lower part of its course has lost all pretensions to natural beauty. Nevertheless, it affords adventurous youth bathing and boating facilities of a sort, and is not altogether without a certain indefinable charm, though its backwaters now offer no eel-spearing sport as they did in the eighteenth century. BOROUGH OF POPLAR CHAMBER OF COMMERCE. No reference to the Borough would be complete without mention of the Borough of Poplar Chamber of Commerce, which has its offices at 87, East India Dock Road. This Chamber, which is a representative organization of the trade interests of Poplar, plays an increasing part in fostering the commercial prosperity of the Borough. The definite value of organizations of this kind to the individual trader is being increasingly recognized all over the kingdom, and they are deservedly earning the recognition of local authorities too. It is self-evident that a well-organized and adequately-supported body of local business men can fill a very useful role in any town in giving expression to the collective opinions of the business community; in keeping a watchful eye upon all matters affecting the commercial life of the locality in pressing, when occasion demands, for timely reforms and improvements; and in collaborating with the local Authorities in important matters affecting the public commonweal. Such a useful place in the life of the Borough, the Borough of Poplar Chamber of Commerce is successfully seeking to fill.